"Not simply a statue of a sportsman but a symbol." A larger-than-life monument will remember Marian Cozma in Veszprém. 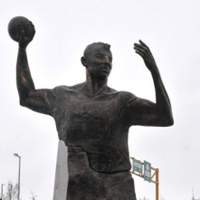 The friends and team mates of the late handball player of MKB Veszprém, together with the fans of club, unveiled the statue of Marian Cozma over the past weekend in Veszprém, Hungary. The father of the player, Petre Cozma, also arrived in Veszprém to attend the ceremony. The memorial was erected from public donation based on the initiative of the Veszprém Fan Club to honour the extremely popular handballer. Marian Cozma lost his life in a brutal incident a year ago, on 8 February 2009. Despite the cold weather and snow, the unveiling ceremony was watched by a large crowed who wanted to pay tribute to the handball giant once again. “This is not simply a statue of a sportsman but a symbol bringing our attention that what happened must not be repeated in the future,” MKB Veszprém coach Lajos Mocsai said. Other speakers, including the Romanian Ambassador to Hungary, the Mayor of Veszprém, team captain Dejan Peric and the President of the Fan Club, also expressed words of comfort to the father of the player, Petre Cozma, who had seen the statue for the first time himself. The successful initiative will help the friends and fans of Marian Cozma pay their respects to the larger-than-life monument located at the square next to the Veszprém Aréna.